US-led Coalition Drops Leaflets Over Iraq Promising $25M Reward For Information About ISIS Leader (Photos) 5 out of 5 based on 1 ratings. 1 user reviews. Airplanes of the US-led coalition and the Iraqi Air Force (IrAF) dropped thousands of leaflets over the central Iraqi city of Ramadi on April 3 promising a reward of up to $25 millions U.S. dollars for any information about ISIS leader Abu Bakr al-Baghdadi. “ISIS leader and his fighters stole your land and killed your people … He is now safely hiding away from the destruction and death that he planted … With your information, you can take revenge on him,” one of the leaflets reads. The fate of al-Baghdadi and his whereabouts remain unknown. Some reports claims that the terrorist leader is hiding in eastern Iraq, while others suggest that he may be taking shelter in the last ISIS stronghold in central Syria, the Homs desert. Last month, U.S. envoy for Syria, Jim Jeffrey, said that the US-led coalition will continue its fight against ISIS and added that the whereabouts of the terrorist group leader are still unknown. These new leaflets were dropped only over al-Ramadi, which indicates that the US-led coalition believe that al-Baghdadi is hiding somewhere in the city. However, there is no reliable information to back this theory. I guess this guy is off from his short-time-empire since months. Brought away by his chiefs in CIA et al. by US-aircraft into some safe haven powered by deep state helpers. If one thinks that this is just conspirationtheory: Why was there this photograph taken in 2013, where you can see Baghdadi surrounded by his co-beheaders AND Mr. McCain! 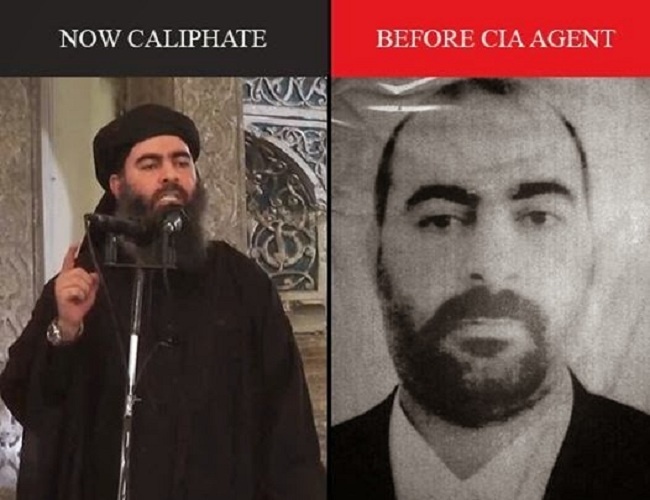 Baghdadi is part of the deepstate’s dirty game, as useful partner, and whatever they will tell us about getting him, killing him or having intelligence about his approved suicide – it’s probably a hoax. They should have dropped those leaflets over Tel Aviv. Snowden, an actor named Elliot Shimon, a Mossad trained operative. Uh now its $25m, they were $1m few months ago, they have no idea where is this guy. Actually living in Tel Aviv with his mom and dad. someone should drop a leaflet over hicksville usa offering 25 million bucks for fatso’s head on a pike, or bolton’s, or abram’s or even donny the dunce’s and similarly for jared kushner – all part of a criminally insane and corrupt junta which more and more resembles a gathering of goebbels, of goehring, of himmler, of heydrich, of bohrmann und zu weiter. great comparison if it wasn’t so friggin spot on! USA is hiding him. USA is trying to shift the world communities attention just like in Osama case.When Osama died naturally their bomb the place were Osama was protected.No country should cooperate with USA killers let Israel whom their do favours work on their lies. Iraq must drop leaflets in NATO head quarters demanding removal of stoltenberg who actually instigate world war.Stoldenberg action threaten world population.